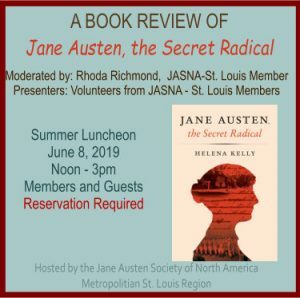 Thank you for further inquiring into your Metropolitan St. Louis Region, Jane Austen Society of North America. Listed below are the Region Officers. They are a friendly arrangement of volunteers who gather, discuss, arrange, write, and pass along all things Jane Austen to you for your enjoyment and participation. If you would like to ask a question or submit a suggestion to one of our officers please contact our friendly Regional Coordinator, Alison Roberts.